Airbus A380 and Boeing 747 Size Comparison. Here is rare occasion between two giants aircraft. 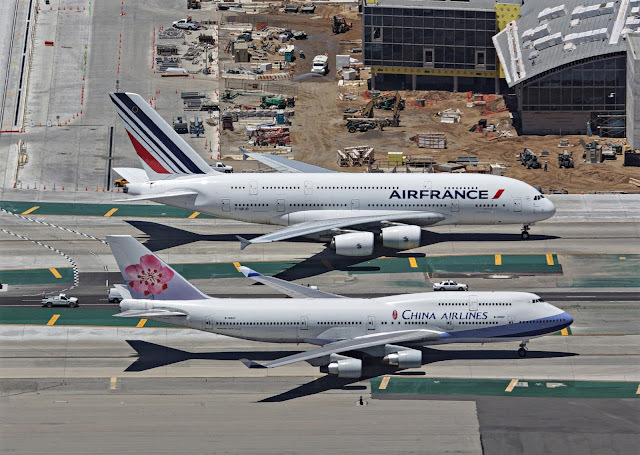 The Airbus A380-800 of Air France and Boeing 747-400 of China Airlines were lining up on the runway. While waiting the ATC to get a takeoff clearance. Speaking of technical dimension, the A380 has about 73 meters overall length and Boeing 747 has about 71 meters long. On other hand, the tall are 24 meters and 19 meters respectively. In terms of overall length, Boeing could "match" Airbus in Boeing 747-8 that has 76 meters in long.